The Klamath Falls depot was built for the Southern Pacific Railroad and opened in April, 1910. It is composed of dark grey random ashlar walls with staggered light stone trim highlighting the windows and doors. A hipped roof with deep eaves supported by brackets protects passengers from inclement weather as they wait outside for the arrival of the train. The waiting room features handsome wood benches and white glass art deco hanging pendants. Renovations took place in 1999-2000 to make the restrooms, ticket counter and entryways compliant with the Americans with Disabilities Act; new carpet and cabinets were also installed. Klamath Falls sits at the southern end of Upper Klamath Lake in the high desert of southern Oregon, and at the beginning of the Klamath River. The Klamath people—Klamaths, Modocs, and Yahooskin band of Snake tribes—were settled there when Peter Skene Ogden, of the Hudson Bay Company, first met them in 1829. These native people are still resident around the lake area. The Applegate Trail, a southerly wilderness route through Idaho, Nevada, California, and Oregon, came through the Klamath Falls area on its way to the Oregon Territory and Willamette Valley in 1846. It received heavy use during the California Gold Rush (1848). George Nurse founded the town in 1867 as Linkville, for the Link River, which is what the upper reaches of the Klamath River is called, and on whose falls the city sits. 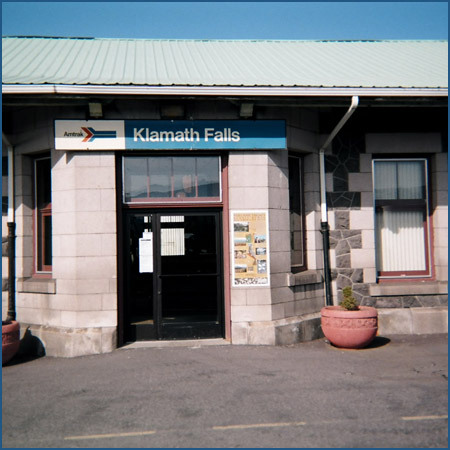 Its name was changed to Klamath Falls in 1892. The Klamath Reclamation Project began 1906, draining marshlands from below the falls area for homesteading and provided water for agriculture. Today, the reclamation project still modifies the river considerably for water storage, power and agricultural use. The wetlands of the Klamath and the river itself were a rich habitat for fish and wildlife, especially the economically significant Chinook salmon—which have been nearly wiped out by the damming. Fish ladders are now being built around many of the dams. Klamath Falls played its own part in World War II, as a Naval Air training station for bomber pilots, since it was the westernmost habitable area east of the Cascade Mountains until reaching the coast, and as a medical station for returning Marines. It also lay close to the Tule Lake Japanese-American internment camp, as well as Camp White, an Oregon POW camp. During the first weeks of the war, a flurry of rumors of a Japanese fleet off the coast brought orders to prepare for blackouts. However, training was not complete: the blast of an air-raid signal from the Southern Pacific train station at two-o’clock one morning was the signal for a city-wide blackout—but uninformed residents, wondering what was going on, woke up and switched on their lights, illuminating the entire town. Practice improved the response. Timber harvesting, given the railroad routes, was a main economic driver in the early 20th century in Klamath Falls, as was farming. Today, the Sky Lakes Medical Center is the largest employer. The town is also home to the 173rd Fighter Wing of the Oregon Air National Guard as well as a company of the Oregon Army National Guard at Kingsley Airfield. Crater Lake is also near Klamath Falls. It is a caldera lake on Mount Mazama, which is part of the Cascade Range volcanic arc. The caldera formed after an eruption about 6,000 years ago collapsed the top of the mountain, and rain water has since filled it. Famed for its deep blue color, at 1,949 feet at its deepest, Crater lake is the deepest lake in the United States, the second deepest in North America, and ninth deepest in the world. The rim of the caldera above the lake is from 7,000 to 8,000 feet.